Barbel love to hide under or tight to streamer weed, sunken branches, tree roots and other submerged obstacles. That makes catching them really difficult. Static leger rigs may seem to be the answer, but often they aren’t. A mistimed or an inaccurate cast might see the heavy rig land bang in the middle of the obstruction – not only snagging up, but also disturbing the fish in the swim. If you’re overly tentative with your cast, your rig might land too far away and the barbel won’t want to move out from the sanctuary of the feature to take the bait, especially in daylight hours. These are the times when a neat link leger rig really comes into its own. A correctly balanced link leger not only allows the angler to reach the desired distance upon the cast, but it also allows you to let the bait trip gently downstream. No longer will you have to accurately cast your rig onto an area the size of a dinner plate. With a link leger you can cast upstream of the fish-holding spot and gradually work it downstream right next to or even underneath the feature. The key to a successful link leger rig is to use the right amount of weight upon the link. Basically you’ll need to squeeze enough split shot onto the link to ensure that the rig sinks quickly and just holds the bottom when the rod is placed upon the rests. 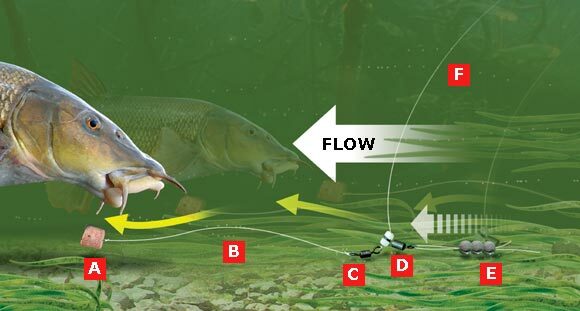 If you leave the rod alone, the rig will remain in place until a fish takes the bait or a large twig or strand of weed hits the mainline as it is swept downstream. But if you gently lift the rod tip to dislodge the rig it will rise up off he bottom and be swept downstream a little closer to the snag. Now place the rods in the rest ready to detect your next bite. You can slowly and steadily repeat this until the rig lies exactly where you want it to be. But this link leger rig offers something a little unique. The split shot can quite easily fall off the link if they become snagged, therefore this rig is very fish-friendly and safe. It’s the perfect rig to use when you’re fishing very tight to snags. You don’t need a huge array of tackle to create this rig. You will need some large split shot, your hook, your chosen hooklength material (braid or mono), strong mainline (around 6-8lb is ideal), a strong swivel and a swivel bead. B – Your hooklength needs to be strong enough to cope with the fight of a barbel. If you decide to use mono, opt for lines in the region of 6-10lb breaking strain. If you decide to use braid to camouflage it against the venue bottom, use 12lb breaking strain. C – The best method of connecting your mainline to hooklength is to use a swivel. D – A swivel bead is the perfect accessory for attaching the leger link. Thread your mainline through the bead end and thread 6ins of strong line through the swivel. Fold this line over and lock the two lengths of line together using enough split shot to hold the rig onto the bottom. The beauty of this style of creating a link leger is that the split shot can quite easily fall off the link if it becomes snagged, leaving you free to play the fish back to the net. E – Your mainline needs to be reliable and strong. 6-10lb breaking strain is ideal for most barbel fishing situations.